Low-wage Workers Stand Up::	Hotel Strike Wins! | Fight Back! 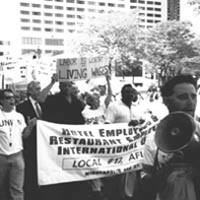 Minneapolis, MN - For 13 days, members of Hotel and Restaurant Employees Union (HERE) Local 17 walked the picket lines at Twin Cities hotels. The strike for better wages, dependent healthcare and dignity on the job garnered national attention. "This was a fight for the lowest paid and the most exploited worker," said Jaye Rykunyk, principle officer of Local 17. At 1:30 a.m., June 28, a tentative agreement was reached. The employers originally offered a 7-cent per hour raise the first year, with the similar 1% over five years. The strike won as much as 44 cents per hour the first year and for the next four following years. Strikers also won dependent healthcare coverage and some commitments for English as a Second Language training and translation pay. The workers won important contract language as well, including respect and dignity clauses that allow workers to file grievances on those issues. "It's a clear victory," said Martin Goff, an officer with the local. "We didn't win all we were fighting for, but this is an important step forward. We won every component we need for a good contract. This opens the door for Saint Paul workers to get what Minneapolis got when they negotiate in six months. Saint Paul workers took this fight up and now they are fired up." This strike's success sends a clear message to non-union workers: unions and organizing work can win improvements on the job. On June 6-9, with 72% voting, 94% of the membership opted to strike. "We want dollars, not dimes, and we will go one day longer until they settle," said Kate Shaughnessy, an organizer for the union. Many hotel employees worked for poverty wages, some bringing home as little as $200 a week or less. "You can't raise a family on those wages, we need more," said Karen Smith, a striking worker. "The hotel industry in this town has been raking in the profits on the backs of these poorly paid workers. Taxes end up supporting corporate welfare for rich companies that won't pay for workers' healthcare," said Jaye Rykunk. Workers walked off the job at 5:30 p.m., June 16 at the Radisson South in Bloomington. In the days ahead, the strike spread to more hotels. Eight days into the strike, seven of nine hotels were out. It was a significant strike for the Twin Cities. Local 17 represents over 5000 workers, 1450 workers at the hotels. Immigrants made up 30% of the strikers. Employees are from Somalia, Vietnam, Togo, Eritrea, Korea, Bosnia, Mexico and elsewhere. Over 17 languages are spoken throughout the hotels. The local made enormous efforts to overcome language barriers and unite the workers to win. With more hotels out and the passage of time, pressure mounted. By June's end, hotel guests were arriving for the massive Alcoholics Anonymous conference. 50,000 conventioneers were in town, with no one but a handful of managers to change the sheets in their hotel rooms. For one hundred miles around the Twin Cities, not a single open hotel room could be found. This was part of the pressure that brought the bosses around to a better agreement. Since May 1, when the contract expired, the union called mass demonstrations to turn up the heat. On May Day, more than 700 members and supporters of Local 17 rallied in front of the Hilton Hotel. Guests at the Regal Hotel got an early morning wake-up call at 7:30 a.m., May 24. Members of Local 17 found out that the owners of the Regal would have an early morning meeting to discuss the contract negotiations. "We're here to let the owners of the hotel know that poverty wages have got to go," said Martin Goff. Eighty people showed up, noisemakers in hand, to send a clear message to the bosses. HERE General Vice President, Ron Richardson, told a June demonstration, "Local 17 is one of the strongest and smartest local unions in the country. Local 17 has become famous in the last few months, all around the country, for being the union that stood up for immigrant workers. This has helped change the views inside the AFL-CIO; now they have a more progressive stand toward immigrants." The Reverend Jesse Jackson also spoke to the rally. Cheers from the more than 700 people cried out in support of the workers, upping the ante on the employers to settle. Labor and community activists mobilized to support the hotel and restaurant workers. A strike support committee worked on raising funds, picket line duty and helping with things like translation, childcare and food drives. "The Twin Cities were watching and supporting these workers. This is what solidarity is," said Steff Yorek, a Strike Support Committee member. "These workers have shined a light on exploitation, and everywhere people are watching. The Labor movement has renewed hope with these workers leading the way."